KIEV, Ukraine -- The Ukrainian Security Service (SBU) has detained a fire inspector for soliciting a $44,000 bribe from a company which was involved in the construction of a new stadium for the Euro-2012 soccer championship in Kiev. Ukraine is one of the most corrupt countries in the world, on par with Tajikistan. Just two days later, State Employment Service chief, Volodymyr Halytsky, and several of his subordinates were detained on suspicion of corruption. Cash and valuables totaling $7.5 million were confiscated during a search of their offices and homes. The two arrests have been the most recent manifestations of the scale of Kleptocracy in Ukraine. Viktor Yanukovych, on his election as president in February 2010, like all his predecessors, proclaimed the fight against corruption as one of his priorities. However, he has failed to improve the situation. Corruption permeates all walks of life, from highway policemen who openly solicit bribes for speeding to government officials who thrive on kickbacks. The case of Halytsky is special because it shows how the corrupt system works at the very top. Under Yanukovych, people connected to three or four of the strongest groups in the government can steal with impunity, the daily Segodnya which is linked to the ruling Party of Regions reported on November 29, quoting its sources. Halytsky, who apparently did not belong to any of these groups, had been warned that he could face problems but he just could not stop, according to the sources. Since 2003 Halytsky had chaired the Employment Service, which pays unemployment benefits and finances companies to create jobs, with a break immediately after the “Orange Revolution” in 2005-2006. Thus, he worked in this position in all the governments under three Ukrainian presidents. During this period, the service’s social protection system was transformed into a system of organized plunder, according to the weekly Zerkalo Nedeli. Funds earmarked for retraining the unemployed have been routinely stolen. Funds disappeared last year that were intended to help Ukrainians launch their own businesses after losing their jobs, and it has been virtually impossible for companies to qualify for compensation for creating jobs without kickbacks. Halytsky has been charged with embezzling money from a fund which was set up to help companies create jobs for former coal miners. The companies in question reportedly had to pay 15 percent to 20 percent kickbacks. The newspaper alleged that Halytsky paid protection money to people’s deputies from the Popular Party which is part of the ruling coalition and is chaired by Speaker Volodymyr Lytvyn. Several former top officials have been arrested and jailed for corruption since Yanukovych’s election as president. Many of them are his political rivals, like former Prime Minister Yulia Tymoshenko, which raises legitimate doubts about their guilt both in Ukraine and internationally. At the same time, several officials who served under Yanukovych have also been punished for corruption. Last October, former Deputy Environment Minister, Bohdan Presner, was jailed for nine years. Last November, the former chief price inspector, Tetyana Rud, was sentenced to five years in jail. The chairman of the state commission for financial markets, Vasyl Volha, has been in custody awaiting a court verdict since last July, when he was arrested on suspicion of bribery. There is a perception in Ukrainian society that these arrests appear to be only the tip of the iceberg and that many officials linked to the very top go unpunished. For example, it is still not clear who owns the estate in a natural reserve area near Kiev, where Yanukovych established his multi-million dollar residence. Chornomornaftohaz, a subsidiary of the state-owned oil and gas company Naftohaz Ukrainy, reportedly overpaid millions of dollars for an oil rig to an obscure company registered in Latvia which had won an apparently fake tender, while Energy Minister, Volodymyr Boyko, asked the SBU to find out who was behind the reports about the deal. 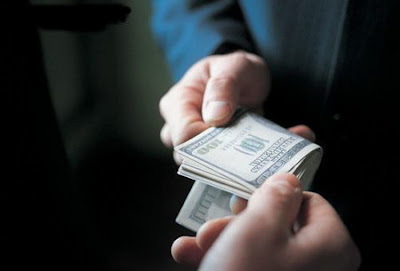 A survey conducted by the International Finance Corporation last year revealed chilling figures: an average Ukrainian company spends some ten percent of its annual turnover on corruption, and the share of those businesses which used unofficial ways of solving problems with state officials rose from 35 percent in 2008 to 46 percent in 2010. Unsurprisingly, Ukraine slipped 18 positions in the Corruption Perceptions Index for 2011, which was released by Transparency International on December 1. Ukraine now shares position 152 out of 183 with Tajikistan. This is the lowest position for the country ever, and Ukraine is lower on the list than all of its peers in the Central and Eastern Europe region including Russia. It scored only 2.3 on a scale of zero to 10 with zero indicating the highest level of corruption, down from 2.4 last year. At the same time, Ukraine has failed to establish an independent anti-corruption body by the December 1 deadline, which was set by the European Union. This has been one of the EU’s requirements for visa liberalization.